Energy subsidies are a complex and enormously important issue, having a major impact on climate change (and thus on the fate of our world, and how livable it remains), on health (via air pollution, especially in developing world cities), as well as distorting our economies. And the level of public debate around energy subsidies and taxes is very poor, with conflicting claims made by the fossil fuel industry, advocates of renewable energy, and advocates of nuclear. Energy Subsidy Reform, a free, 2-week, online MOOC style course run by the IMF on edX, sounds like a much-needed corrective. This entry was posted in Climate, Economics, Energy on 11 August 2014 by Chris Watkins. I came across Design for an Empathic World: Reconnecting People, Nature, and Self – without having read the book, I love the title. What a wonderful aspiration for design – it reminds me of the design classic by Victor Papanek, Design For The Real World: Human Ecology and Social Change , which inspired me as a teenager. This entry was posted in Design, Ecology and tagged design on 6 January 2014 by Chris Watkins. A local food story – an apparent success story – is Mad River Food Hub. The Co.Exist article is a nice long read, but for those like me who want to get to the nub, here are the highlights. After a long intro about unprofitable and failing farmers’ markets, we get to local food hubs, and the hope that a system of local “food hubs” can make local food work by processing and bundling foods and delivering them to us. Wonderful idea – but like farmers markets, most food hubs are not thriving. The only way farmers are going to make more money is by getting more value out of their products. That’s Robin Morris, the brains behind the Mad River Food Hub. But even with these value-adds, Morris couldn’t make the numbers work for a profitable – economically sustainable – food hub, until he did the numbers for meat. Meat is a year-round business, with potential for significant value-add from processing and curing, products selling for up to $24/lb for dry-cured prosciutto. Now, meat raises ethical issues, especially if you’re vegetarian. Personally, since I know people will continue to eat meat, I’m happy to see any move away from massive factory farms which cause enormous suffering. There’s no guarantee that local artisans will treat animals less cruelly, but at least there’s a likelihood of free range and organic products, which can be a significant improvement. Back to the article – a key takeaway is that Morris approached his hub with a tough business sense, to make the hub and its food food producers profitable. The hub invested heavily in facilities so that its food-producing entrepreneurs didn’t have to – the hub is an incubator, allowing local food entrepreneurs access to the (expensive) infrastructure for launching their business, in exchange for a cut of the sales. Finding a niche for the hub has also been key – the hub doesn’t compete at cut-throat price points to sell to institutional clients such as cafeterias. Of course – a small or mid-sized operation could never compete on price, and could only profitably supply an unusually understanding institution that committed to supporting ethical food. As a result, businesses are growing that otherwise would have no hope, and Mad River Food Hub operates without grants. The hub produces salamis, soups and “Rookie’s Root Beer” among products, and also packs and distributes farm produce. This approach makes local food possible. Just to fit out a place like this and meet USDA regulations? Let’s say $250,000… Easily. This allowed me to skip that gray area where I’d take on a lot of debt to ramp up and expand, and basically gamble that I could meet all the monthly payments. The share shows up at work, it’s boxed, it’s got their name on it, and they walk out the door with it. The potential is really big… if I can drop it off on their doorstep, they sign right up. This takes local food beyond the eco-nuts, those of us who go out of our way and pay extra to support it. With its efficiencies and its distribution system, it might just make for local food that is actually sustainable – because driving miles out of your way to pick up your organic veggies certainly isn’t. See How To Build A Local Food System, To Make Local Food Actually Work | Co.Exist. More reading on local food: Locally Delicious – buy from Amazon or read on Appropedia. This entry was posted in Entrepreneurship, Food on 4 January 2014 by Chris Watkins. Bill Gates takes a methodical approach to low carbon energy. Many things are needed – above all, large investment in innovation across many areas. This entry was posted in Climate, Energy and tagged TED, video on 4 December 2013 by Chris Watkins. I hardly need to point out the parallels with climate change. This entry was posted in Ecology, Science and tagged climate change on 15 November 2013 by Chris Watkins. Harvest of tomatoes, cc-by-sa 2.0. 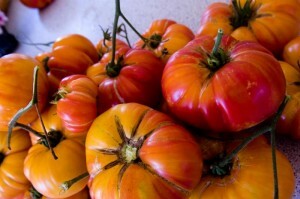 Want to see abundant quality food harvested in our neighborhoods? Good news on that front: Growstuff and Permaculture Melbourne are developing a tool to record and share our harvests, and to show how much food is being grown in urban and suburban gardens. It’s now live. We want to find what the best gardeners can produce on their plots of land. This becomes a benchmark for their area. The benchmarking project is hoping to indicate the power of urban gardening. If 20% of households could grow at the benchmark rate, then how much food could an urban community produce? We think it’s a huge amount. We think there’s an urban food production industry waiting to be recognised. The aggregated data will tell us about the capacity of our communities to feed ourselves, broken down by area and crop type. This is the first time data has been collected and made available in this way – a milestone for urban food growing and urban resilience. Growstuff is headed up by ex-Google coder and food grower, Alex Bayley. I’ve doing pair programming on the harvest tool with Alex, and learning much – her coding skills are so far ahead of mine that I’m pretty much watching her code, but that’s the collaborative and inclusive approach of Growstuff. I can vouch for Alex, who could be earning big money in the tech industry, but is instead following what she believes in, and does much of her coding at a kitchen table, looking out on a vegetable garden. Sign up for a paid membership with Growstuff. Use the signup code HARVEST2013, so we know how you arrived. Free memberships are fully functional, awesome, and ad-free, but as a paid member you have the warm glow of knowing that you’re making Growstuff and the Harvest Benchmarking project possible, and you’re identified as a supporter on your profile. Check out the harvests and record your harvests on Growstuff’s brand new harvest page – and stay tuned as we refine it and add more features. Think how motivating it will be to know that gardeners are producing not just a few tomatoes, but hampers and buckets full of delicious, fresh food, in our own neighborhoods. This will be a real boost to urban food growing and local resilience, to have this knowledge and data about local food production – for our own knowledge, for our communities, and in our dealings with our local governments. Knowing what successful gardeners can produce on their own land and mapping this by area, we can discover the potential of urban gardening. Thank you to Lucas Gonzalez from the Appropedia community, who connected us up via Twitter – the spark that let this synergy happen. Update: Alex Bayley describes the new functionality at Track your harvests with Growstuff. 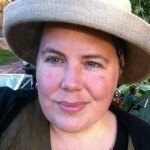 This entry was posted in Transition and permaculture and tagged food growing, global, Growstuff, Melbourne, open data, open source, web on 24 October 2013 by Chris Watkins.